For similarly named places, see Farringdon (disambiguation). 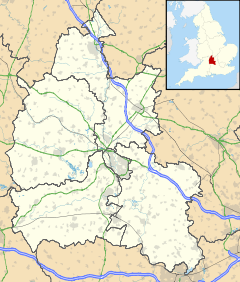 Faringdon /ˈfærɪŋdən/ is a historic market town in the Vale of White Horse, Oxfordshire, England. Within the historic boundaries of Berkshire, it is 18 miles (29 km) southwest of Oxford, 10 miles (16 km) northwest of Wantage and 12 miles (19 km) east-northeast of Swindon. It is a large parish, its lowest parts extending to the River Thames in the north and its highest ground reaching the Ridgeway in the south. Faringdon was the westernmost town in Berkshire until the 1974 boundary changes transferred it to Oxfordshire for the purposes of administration. On 1 February 2004, Faringdon was granted Fairtrade Town status, becoming the first Fairtrade Town in South East England. Faringdon is the base for the Faringdon Enterprise Gateway, which is run by the South East England Development Agency to help and advise businesses in rural west Oxfordshire. The toponym "Faringdon" means "fern covered hill". Claims that King Edward the Elder died there are incorrect. The town was granted a weekly market in 1218, and as a result came to be called Chipping Faringdon. The weekly market is still held today. King John also established an abbey in Faringdon in 1202, (probably on the site of Portwell House) but it soon moved to Beaulieu in Hampshire. In 1417 the aged Archbishop of Dublin, Thomas Cranley, died in Faringdon while journeying to London. The Church of England parish church of All Saints may date from the 12th century, and the clerestorey and possibly the west end of the nave survive from this period. A Norman doorway survives, although not in its original position, in the baptistery. The chancel and north transept are 13th century and the west chapel is 14th century. The north chapel is a late medieval Perpendicular Gothic addition with 15th century windows. All Saints has a central bell tower, which was reduced in height in 1645 after it was damaged by a cannonball in the English Civil War. Faringdon was fought over because it commands the road to the Radcot Bridge over the River Thames. The tower now has a ring of eight bells. The three oldest bells were cast in 1708. James Wells of Aldbourne, Wiltshire cast the tenor bell in 1779 and another bell in 1803. The three youngest bells, including the treble, were cast in 1874 by Mears and Stainbank. The churchyard is reportedly haunted by the headless ghost of naval officer Hampden Pye. According to local legend, Pye was decapitated in a battlefield explosion while fighting in the War of the Spanish Succession after being convinced to enlist by his mother who sought to separate him from a local girl she considered an unsuitable match. An alternate local legend states that Pye was an unfaithful husband who was decapitated by his wife with a gun. The ghost was reportedly exorcised shortly after Pye's death. The Old Town Hall (formerly the Market Hall) in the Market Place dates from the late 17th or early 18th century and is a Grade II* listed building. Just east of the town is Folly Hill or Faringdon Hill, a Greensand outcrop (at grid reference SU298957). In common with Badbury Hill to the west of the town, it has an ancient ditched defensive ring (hill fort). This was fortified by supporters of Matilda sometime during the Anarchy (1135–1141) – her campaign to claim the throne from King Stephen – but was soon razed to the ground by Stephen. Oliver Cromwell fortified it in his unsuccessful campaign to defeat the Royalist garrison at Faringdon House. The Pye family had Scots pines planted around the summit, around the time that Faringdon House was rebuilt in the late 18th century. This is a conspicuous and recognisable landmark that can be seen from afar, including from the Vale of White Horse, White Horse Hill, the Berkshire Downs near Lockinge and the Cotswolds to the north. The folly on Folly Hill was designed by Lord Gerald Wellesley, later 7th Duke of Wellington, for Lord Berners and built in 1935. It is 140 feet (43 m) high and affords panoramic views of the Vale of White Horse. It once had a sign saying "Members of the public committing suicide from this tower do so at their own risk". During the Second World War the Home Guard used it as an observation post. In 1982 Robert Heber-Percy restored it and gave it to the town in trust. It has been a Grade II listed building since 1986. Near the top of London Street near Faringdon Folly is the pub bearing the same name. There is a manor house and estate, close to the edge of Faringdon, called Faringdon House. The original house was damaged during the civil war. Its owner at the time, Sir Robert Pye, who was a Royalist, was put under siege by his own son Robert who was a Parliamentarian colonel. Building of the current, smaller, house began about 1780 and was not completed until after 1785. The house was bought in 1787 by William Hallett Esq. It was the home of Lord Berners in the middle part of the 20th century. It is now owned by the writer Sofka Zinovieff, the granddaughter of Berners' companion, Robert Heber-Percy, who inherited it on Berners' death in 1950, though she does not live there. Faringdon is the site of the noted Faringdon Sponge Gravel Member, part of the Cretaceous Lower Greensand Group. It is rich in fossil sponges, other invertebrates, a few vertebrate bones and teeth, and good examples of bioerosion. The £1.6 million 3 miles (5 km) A420 Faringdon Bypass was opened in July 1979. Faringdon is linked with Swindon and Oxford by a frequent service operated seven days a week by Stagecoach in Swindon, and an hourly service to Wantage, continuing on to Didcot and Abingdon, run by Thames Travel and operating Mondays to Saturdays. A 3.5 miles (5.6 km) Faringdon branch line was opened in 1864, between Faringdon and the Great Western Railway (GWR) at Uffington, with construction funded by the Faringdon Railway Company (bought outright by the GWR in 1886). Passenger traffic peaked in 1913, but later declined to such extent that the passenger service was withdrawn in 1951. Goods traffic continued to use the line until the Beeching closures of 1964. The Faringdon railway station building is still extant, having been used for various commercial purposes (currently a nursery school). Faringdon is notable for the dyed pigeons at Faringdon House. The custom of dyeing pigeons was originally started by the eccentric Lord Berners. Around the town one can see a number of stone plaques with comments such as "Please do not throw stones at this notice" reflecting Lord Berners' ongoing influence on the town. Since 2004, Faringdon has held an annual festival over one summer weekend. The festival, originally known as the "Faringdon Arts Festival" is now known as "FollyFest" and generally runs on the first weekend in August by a committee of volunteers as a not for profit event. International professional wrestler Mark Haskins, who fights as the "Star Attraction", was brought up in Faringdon and has family in the town. ^ "Great Faringdon Parish". nomis. Office for National Statistics. Retrieved 3 September 2018. ^ The relevant reference to Fearndune in the Anglo-Saxon Chronicle is now thought instead to refer to Farndon in Cheshire. ^ "All Saints' Church Faringdon ·". Allsaintsfaringdon.co.uk. Retrieved 29 July 2015. ^ "Branch Towers". Oxford Diocesan Guild of Church Bell Ringers, Vale of White Horse Branch. 21 September 2014. Retrieved 29 July 2015. ^ "Highworth Historical Society Ghost of Faringdon Churchyard". Highworth Historical Society. Archived from the original on 5 May 2013. Retrieved 6 April 2013. ^ Historic England. "Old Town Hall, Market Place (Grade II*) (1048440)". National Heritage List for England. Retrieved 24 November 2014. ^ Pevsner 1966, p. 142. ^ Miller, Norman (1 July 2016). "The surreal and colourful life of Baron Berners". The Daily Telegraph. Retrieved 21 June 2017. ^ Historic England. "Details from listed building database (1048457)". National Heritage List for England. Retrieved 29 July 2015. ^ "A Genealogical and Heraldic History of the Commoners of Great Britain and ... – John Burke". Books.google.com. Retrieved 29 July 2015. ^ Pevsner 1966, p. 140. ^ Cooke, Rachel (19 October 2014). "The Mad Boy, Lord Berners, My Grandmother and Me review – a family saga with all the trimmings". The Observer. London. Retrieved 28 January 2016. ^ Cecil, Mirabel (18 October 2014). "My mad gay grandfather and me". The Spectator. Retrieved 28 January 2016. ^ British Geological Survey. "Faringdon Sand Formation". The BGS Lexicon of Named Rock Units. Natural Environment Research Council. Retrieved 24 November 2014. ^ "Stagecoach Gold S6". Stagecoach UK Bus. Retrieved 22 October 2018. ^ "67/67C". Thames Travel. Retrieved 22 October 2018. ^ Ross, Judith. "Lord Berners". Faringdon History. Archived from the original on 24 January 2009. Goodrich, PJ (1928). Great Faringdon: Past and Present. Oxford: privately circulated. Ditchfield, PH; Page, William, eds. (1924). A History of the County of Berkshire. Victoria County History. IV. assisted by John Hautenville Cope. London: The St Katherine Press. pp. 489–499. Pevsner, Nikolaus (1966). Berkshire. The Buildings of England. Harmondsworth: Penguin Books. pp. 139–142. Wikimedia Commons has media related to Faringdon.